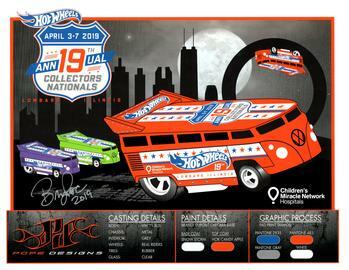 18th Annual Collectors Nationals Designer Autograph Sheet of the VW Drag Bus and T1 VW Drag Bus by Bryan Pope. The collectors event holds numerous autograph sessions throughout the annual Nationals Convention. Hot Wheel and Mattel designers and guests are invited to spend time with the collectors and provide signed prints of their individual vehicle designs or graphics designs. These autograph sessions are a big hit amongst collectors with many standing in line for up to two hours at a time to have the opportunity to talk to Mattel designers, staff, and other invited diecast guests.